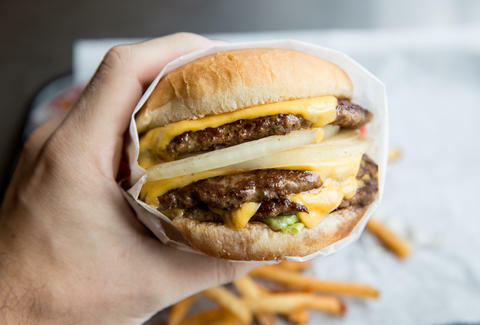 Debates will rage over whether it's the seventh most meaningful cheese in the world or an insult to burgers, but even the harshest critics will agree that nothing melts in your mouth (or arteries) quite like American cheese. From its foreign birthplace to the world record video for most slices eaten in three minutes, here are 14 factlets about America's favorite processed milk product. 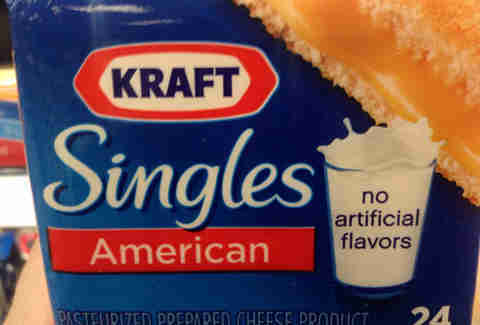 Less than 51% of a Kraft Single is cheese, so it can't technically be labeled as such. Milk, whey, and milk protein concentrate are the three biggest ingredients, all of which Fooducate outlines here. Back in 1915 the Kraft company first sold its block processed cheese packaged in 3 1/2- and 7 3/4-ounce tins, a method that it patented the following year. There are scarce details on its origins, but the consensus is that the first iteration of American cheese was developed using Emmentaler cheese and sodium citrate in order to improve shelf life. The New York Times reported that although the original Kraft version applied the same concept as the Swiss method, it eschewed Emmentaler in favor of cheddar heated at 175 degrees for 15 minutes. 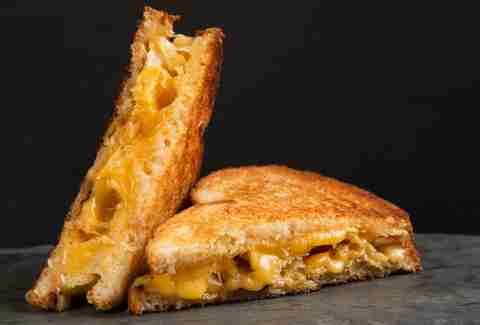 Before sodium phosphate became commonplace in grilled cheese sandwiches, it was used to preserve corpses. 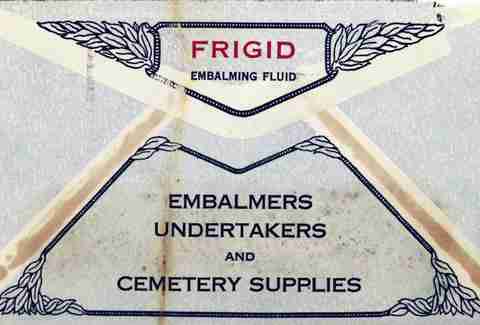 This led early 20th-century cheese snobs to lobby for the off-putting title of "embalmed cheese." Federal regulators weren't swayed; they settled on the term “process cheese” instead. Due to a dairy surplus, Reagan began giving out free “government cheese” through the Temporary Emergency Food Assistance Program in 1981. The program petered out in the '90s, but earned a poignant memorial from VICE. Kraft has reduced sodium levels twice since 2010 and also worked to remove many artificial preservatives, going so far as to earn a Kids Eat Right seal of approval (which HuffPo casts serious doubt on). 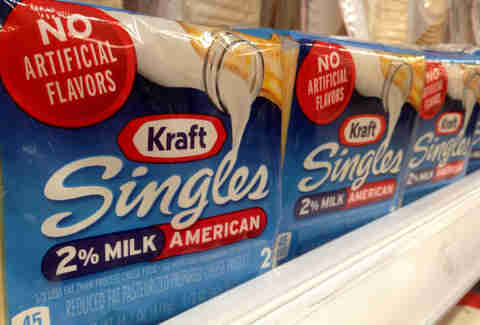 Although it had been sold sliced since 1950, the individual sleeve didn't enter the Kraft canon until 1965 when the company purchased the rights to the process from an Indiana inventor who patented the plastic packaging in 1956. 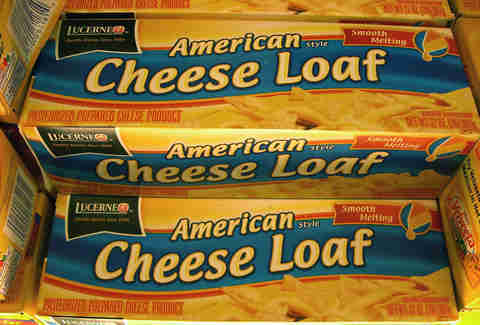 When Did Americans Become Such Snobs About American Cheese? That's not even counting sandwiches stuffed with potato chips, pineapple, or bacon. Thin plastic strips from its 3 and 4lb packages had a nasty habit of becoming a choking hazard, leading to the recall of 36,000 cases in the US, Puerto Rico, and Grand Cayman. Two months later the recall was expanded to include 335,000 cases internationally. The patriots over at Serious Eats did a serious investigation into different brands, and although Kraft is the innovator and most ubiquitous, SE actually preferred the generic version. And they're probably very tired of people making Kraft jokes. The dudes at Freak Eating, who can also drink an entire case of 12 Hour Energy without dying, managed to devour 46 Kraft Singles in three minutes. They didn't make it to their original goal of 48, but that just gives them an excuse to try again. To savvy food conglomerate scholars, it might not be surprising that the two brands are linked, but the Kraft Single wouldn't be what it is today if not for the acquisition of Velveeta in 1927. 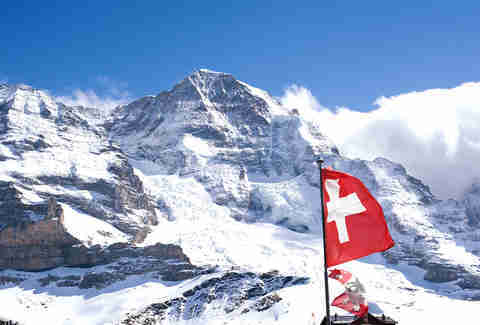 Smithsonian Magazine reports that James L. Kraft bought the fledgling Swiss company because it had developed a more meltable version of processed cheese that featured whey. The ingredient is found in both brands today. Dan Gentile is a staff writer at Thrillist. He hasn't purchased American cheese in years, a fact that will have changed by the time this article is published. Follow him to melty pleasures at @Dannosphere.